The South West and Central Asian Regional Office is hosted at the Byurakan Astrophysical Observatory (BAO) in Armenia. The International Astronomical Union’s (IAU) Office of Astronomy for Development (OAD) has established South West and Central Asian (SWCA) OAD office in Armenia. 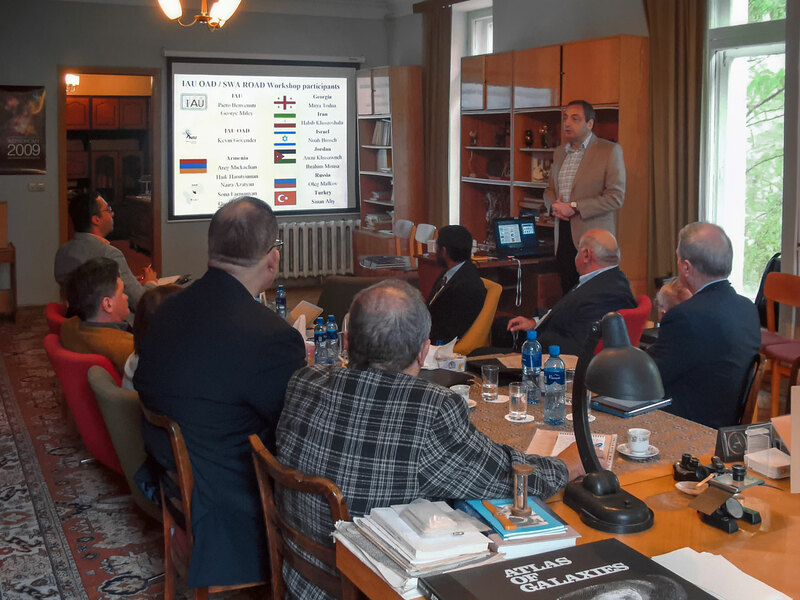 The Armenian office is hosted by Byurakan Astrophysical Observatory and coordinates astronomy for development activities in Armenia and nearby countries, thus realizing the IAU Strategic Plan and implementing the relevant functions. Since the beginning of the OAD, Armenia has been rather active in proposing projects and submitting a proposal to host a regional office in Southwest Asian area. Armenia and particularly Byurakan Astrophysical Observatory (BAO) is a reliable centre for astronomy development in the Southwest Asia region, involving the South Caucasus countries (Armenia, Georgia and Azerbaijan), Iran, Turkey and Israel, where efforts are being made to develop astronomy (Arabic countries develop their own project for a similar centre). In addition, in frame of the European Eastern Partnership program, Armenia will play a role of the link between Europe and Eastern countries. Central Asian countries (former USSR republics) Kazakhstan, Uzbekistan and Tajikistan may also join. 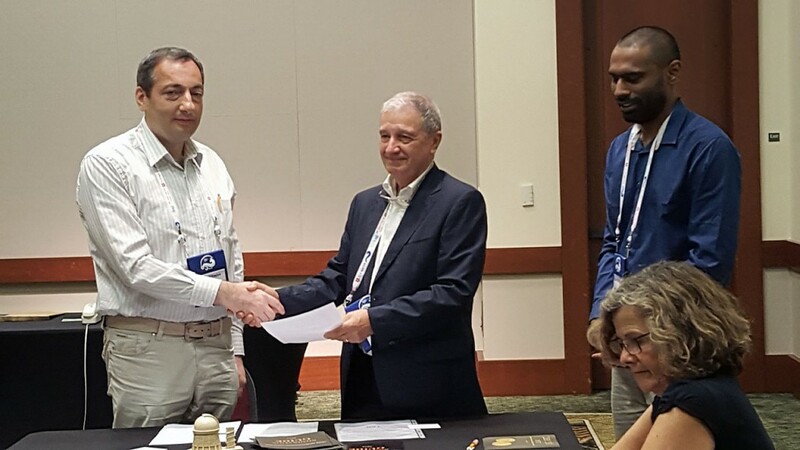 The agreements for the new regional offices were signed at the Hawai’i Convention Centre in Honolulu, Hawai’i, during the IAU’s triennial General Assembly. At the Opening Ceremony of the South West and Central Asian Regional Office in Armenia, Radik Martirosyan, President of the National Academy of Sciences of the Republic of Armenia gave a welcome address; other talks were given by IAU General Secretary Piero Benvenuti, IAU OAD Director Kevin Govender, Director of Byurakan Astrophysical Observatory Haik Harutyunian, Astronomy for Development IAU Strategic Plan 2010-2020 Coordinator George Miley and IAU SWCA ROAD Director Areg Mickaelian. The event was attended by the representatives of the regional countries, the participants of the Iranian-Armenian conference, ambassadors, and the representatives of cultural, scientific and educational communities. Areg Mickaelian (Byurakan Astrophysical Observatory and Co-President of the Armenian Astronomical Society) giving a presentation on the new IAU South West and Central Asian OAD Regional Office. Just after the establishment of the office, the SWCA ROAD organized its first workshop; among the participants were IAU and IAU OAD Officers, and the representatives of other regional countries. Also the first Armenian-Iranian Astronomical Workshop was organized. Further plans are to establish a permanently operational Office in Byurakan with dedicated staff, create a regional Steering Committee, define the list of countries that will develop activities in frame of our ROAD, develop business plan for forthcoming years and start activities in frame of ROAD, including strengthening of contacts between the regional countries, establishing scientific collaborations, joint research and observing programs, exchange of scientists, training of young researchers and students, organization of meetings and schools, invitation of outstanding scientists to give lectures in the region, regional Olympiads, science camps, publication of scientific, popular and promotional books, booklets and other materials, and organization of all activities through the dedicated ROAD webpage.